The bloc is Cuba's second-biggest trading partner after Venezuela. 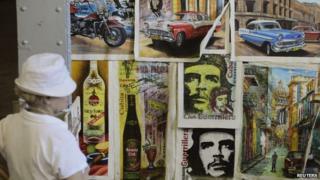 EU foreign policy chief Catherine Ashton stressed that human rights remained "at the core" of its dealings with Cuba. "These negotiations will help consolidate our engagement with Cuba," she said. "I hope Cuba will take up this offer." The announcement comes with Cuba engaged in an economic and social reform process launched by President Raul Castro. The EU ambassador to Havana, Herman Portocarero, said the talks came in response to "serious" changes in Cuba. "It is to some extent a vote of confidence in the reforms and that the new realities in Cuban society are irreversible, and that we want to be on board," Mr Portocarero told the BBC. "We hope to promote a future model of Cuban society which is closer to European values." But he added that the EU had a number of "red lines" in order for the relations to be normalised. These included such issues as human rights and the possibility for civil society groups to have legal status. The move indicates the most important diplomatic shift since the EU lifted sanctions against Cuba in 2008. It follows the visit by Dutch Foreign Minister Frans Timmermans to Cuba in January. During his trip, Mr Timmermans called on the EU to change its policy toward the island. He said the best way to promote change was through dialogue, not isolation. Despite the policy, more than half of EU member states have bilateral agreements with Cuba.